Half price happy hours – that’s 50% off!! 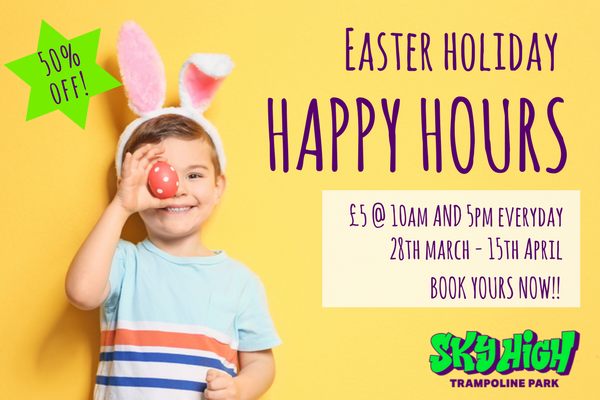 Pay only £5 per bouncer (instead of the usual £10) in the 10am session and the 5pm session, every day of the Easter Holidays! The Easter holidays timetable runs from 28th March to 15th April. Please book in advance – these sessions will sell out. Happy Easter Bouncing! Please note there will be no 5pm happy hour session on Thursday, 12th April due to Sky High/Press Start 2 Join’s joint gaming/bouncing event. Fancy winning a free bounce? 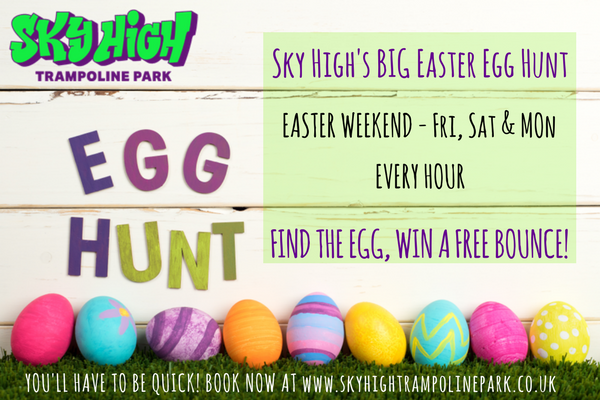 If so, head over to Sky High on Friday 30th March, Saturday 31st March or Monday 2nd April and take part in our big Easter Egg Hunt. Every hour an egg will be hidden somewhere in the park. All you have to do is find it, hand it to a member of staff and you’ll win a free bounce session. Simple! Book your bounce session now – Easter weekend will be busy in here!